Y Combinator-incubated LendUp launched in October with backing from Kleiner Perkins, Andreessen Horowitz, Google Ventures, Kapor Capital and others, to bring a fresh solution to an old problem: You have to pay your bills now, but you don’t have the money to pay them. Rather than turn to predatory lenders and banks, with their high interest rates, borrow money from friends or cover your eyes and hope they go away, what do you do? It may seem like a situation that only befalls the chronically irresponsible, but in fact, 15 million Americans turned to payday lenders to borrow money last year. Instead of ending up saddled with long-term debt from hidden fees or wrestling with Draconian terms and costly rollovers, LendUp wants to give those looking for a speedy fix to a short-term financial conundrum a way to borrow money without hidden fees, costly rollovers and high-interest rates. The lending space at large has begun to brim with startups — like BillFloat, Zest, Think Finance, Kabbage, On Deck and Lending Club — each of which is trying to make it easier for consumers and small businesses to get access to capital without having to jump through a million hoops. LendUp, in contrast, is positioning itself as a direct lender, using technology and Big Data to allow consumers with poor or no credit to get access to small-dollar, short-term loans (of up to $250 for 30 days) and build their credit while doing so. Unfortunately, most credit agencies turn their backs on payday loans, so even if people are able to pay them on time, it doesn’t help their credit scores and the cycle of bad credit keeps on spinning. Most banks won’t touch these kind of loans because they’re high-risk, but like On Deck Capital (which is attempting to streamline the lending process for small businesses), LendUp uses Big Data to do instant risk analysis and evaluate creditworthiness, weeding out those who have bad credit for a reason from those who may have become victims of the system. Along with eschewing hidden fees, rollovers and high interest rates, LendUp streamlines the application process for loans — which traditionally takes forever — by customizing the process. In other words, rather than make everyone submit bank statements, credit reports and so on right from the beginning, it crunches available data and approves those with good credit instantly. It only requests more information from you if questions arise, approving or rejecting as soon as it has enough information to make an informed decision. Co-founders Jacob Rosenberg and Sasha Orloff tell us that they’re able to build a dynamic application that changes in realtime based on customer risk profiles and segment with a higher level of accuracy by utilizing data sources that most banks or credit bureaus don’t consider. That could be data from social media or other lesser-used credit institutions. With its foundations in place, today the startup is taking its formula one stop further, offering instant online loans. This means that LendUp now has the ability to deposit money in your account in as little as 15 minutes, so that consumers not only can apply for and get approved quicker than than they normally would, but they now have near-instant access to that loan. LendUp loans are also available on mobile, so unlike its aforementioned lending competitors, LendUp deposits that money into your bank account, which you can then access from your laptop or while you’re on-the-go. Orloff, who has nearly 15 years of experience working in credit analysis at the World Bank, Citigroup and others, says that the biggest problem inherent to the current lending process is that it can take up to four days for people with good credit to be approved for loans. When you need money right away because of impending deadlines, when it’s an emergency, that’s too long to wait. By depositing loans directly into your bank account and making that capital available while you’re on the go, the founders believe that they’re removing one of the last advantages of going to a payday loan store rather than borrowing online. Participating banks offer instant direct deposits and loan decisions through LendUp, while users with non-participating bank accounts will receive loans the next business day. It also hopes to incentive users by offering financial education through its “LendUp Ladder,” which aims to help borrowers with poor credit improve their credit scores by using LendUp to pay their loans on time. With its new announcement today, LendUp is removing one of the last barriers that stands in the way of short-term, payday lending that actually offers fair terms to the consumer. 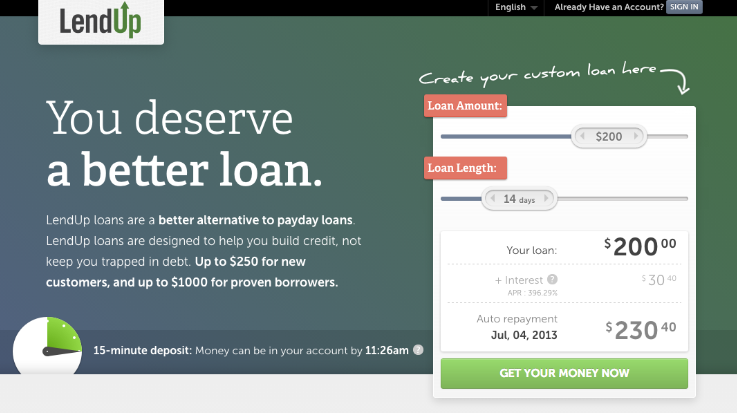 So, while the word “disruption” is overused in Startup Land, LendUp has begun to create a service that seems like it could have real disruptive potential in the predatory world of payday lending. Find LendUp at home here.